I’ve always been a seafood fan, and I specially love a good piece of fresh salmon. I prefer to prepare simple meals during summer months when the kids are home and running the oven and stove for long periods only makes the house hotter. 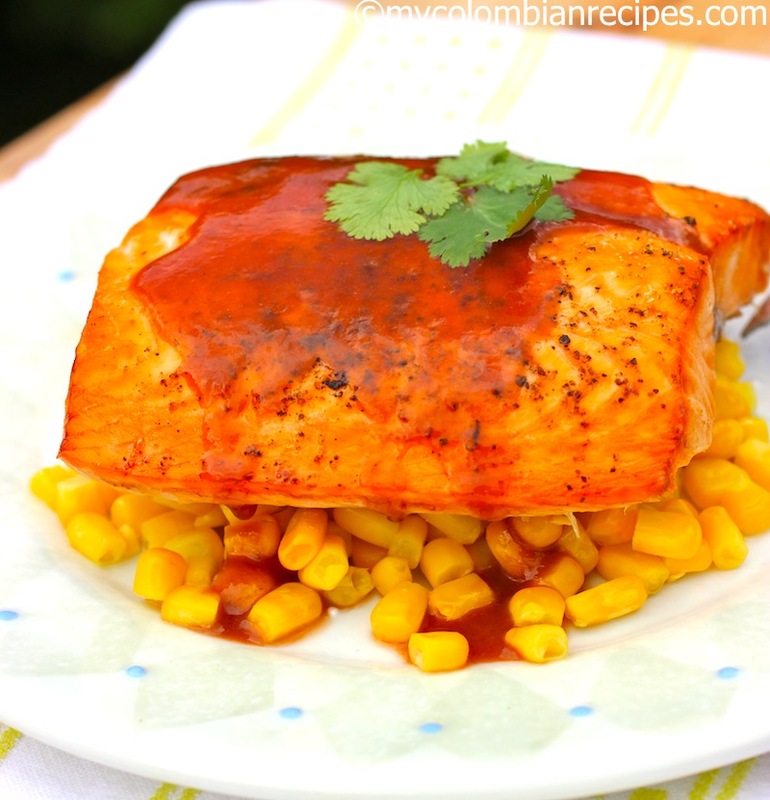 This salmon recipe is one of the easiest and simplest fish dishes to prepare. It does not need much cooking time and it can be prepared using the same basic method, while using a variety of different ingredients and flavors. My kids are not big fish eaters, unless I make fish tacos or fish quesadillas. They love just about anything wrapped in a tortilla! 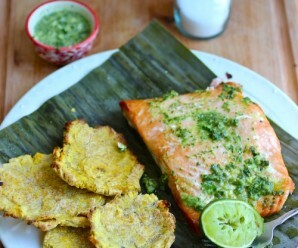 But I finally found a fish dish that they love and will eat every bite without complaints, and that’s this Salmón with Guava Sauce or Salmón con Salsa de Guayaba. I first made this fish recipe using cod fish and it was good, but we didn’t love it. So Last week I bought a big piece of fresh salmon and I decided to make the same guava sauce again. 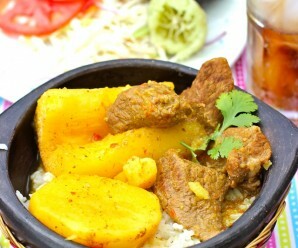 The guava sauce was simply made with fresh garlic, ground cumin, guava paste and orange juice. I think the reason my kids actually loved this dish was due entirely to the guava sauce. Actually, I think they would eat just about anything with this sauce. Guava (guayaba) is a delicious and popular fruit in Colombia and Latin America. We eat it fresh or we use it to make all sorts of dishes, including savory sauces like the sauce used to top this Salmon. This guava sauce is both a little sweet and tangy, which works beautifully with salmon. I served this dish with a side of fresh steamed corn. 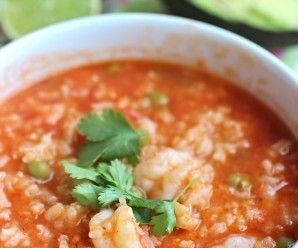 This is a light and flavorful meal, perfect for lunch or a light dinner. Meals like this are on the regular menu plan at our home, simple to prepare, but full of flavor. 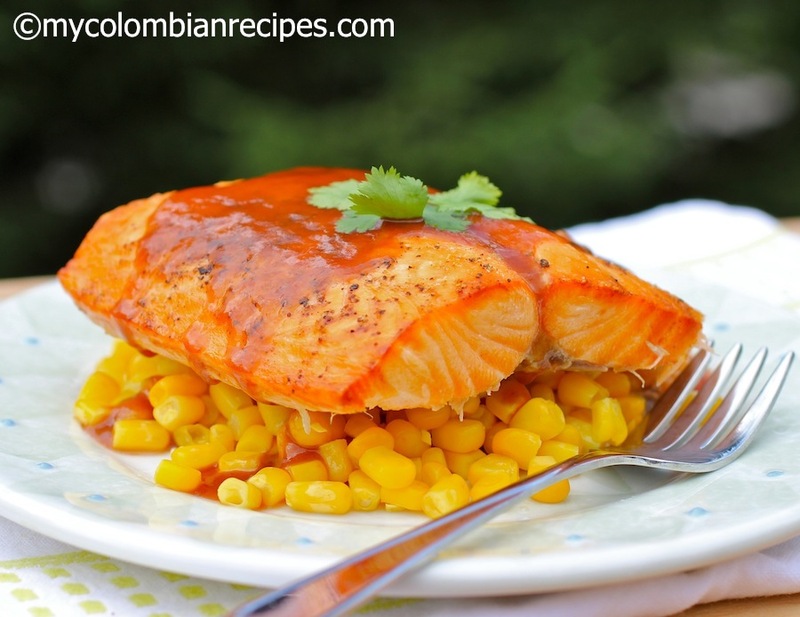 If you like sweet and savory combinations, odds are you’ll love this Salmon with Guava Sauce or Salmón con Salsa de Guayaba recipe.Try it! Season salmon with onion powder, salt and pepper. Place salmon, skin side down, on a non-stick baking sheet. Bake until salmon is cooked, about 12 to 15 minutes. Meanwhile make the sauce: In a medium saucepan, warm the oil over low heat, add the garlic and cook until soft, but don’t let it get any color. Add the rest of the sauce ingredients. Simmer about 10 minutes over low heat, stirring often. Pour the sauce over the salmon fillets. Garnish with fresh cilantro and serve immediately. I love the idea of a guava sauce to go along – great twist on the typical lemon! I’m with the children..this sounds amazing. This must be very delicious! Love the guava sauce. 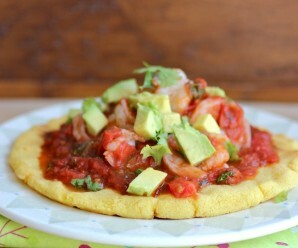 What a great idea Erica…I love guava but never thought in adding to fish…thank you for the inspiration. 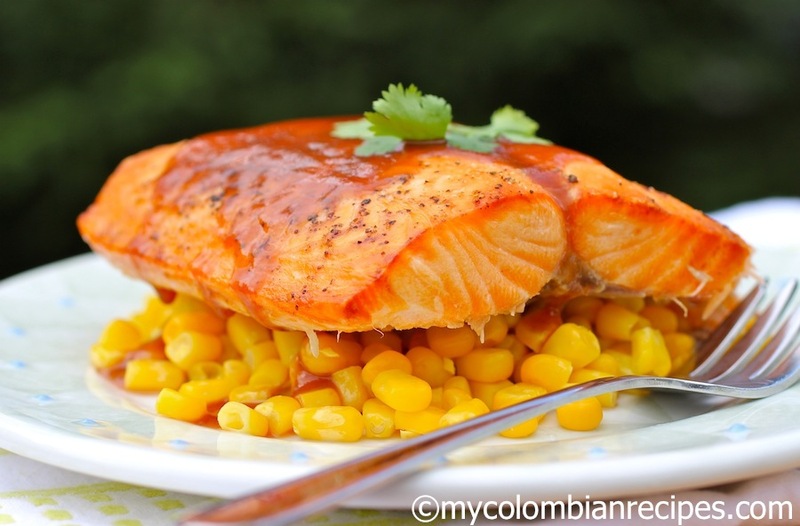 This is not a traditional Colombian dish, it is my own creation!I like to create dishes using Colombian ingredients and flavors like this Salmon con Salsa de Guayaba! It is now, because Erica has made it so. I have many cans of salmon… can I use them? Sorry Keren, but canned salmon is just not the thing for this. It has to be fresh salmon for the flavour and texture. Hi there. This recipe looks great & can’t wait to try it with my family. Quick question – can I use guava preserves in place of paste? Thanks!